At the ripe age of sixty, I make this unparalleled confession. Youths! I invoke your sympathy. Maidens! I claim your tears. So finally, finally I got around to reading the classic that is The Woman in White. Many thanks to Murder by Death for being my reading buddy. It certainly helped me to sustain momentum at the end. About the book, I am so glad I read it. I didn’t love it, but I fully acknowledge that it is a remarkable book and, its time, must have caused quite a stir. I loved the narration from several points of view – basically, every character got their say at one point. Even a grave stone got a paragraph to tell part of the story! I loved the plot and the twists – but I won’t go into them because, erm, spoilers and such – even tho I already had a good idea of where the plot was going to go. I loved that there was such a mix of characters. From the courageous, to the devious, to the whiny, to the downright pathetic. And no, the “hero” of the piece was not necessarily the best character. In fact, Walter Hartwright was such an annoying, whiny, lovesick puppy for the first part of the book that I felt some great relief when another character took over the narration. Luckily, Laura is absent for much of the book because…..ahaha….it’s a mystery. The easy elegance of every movement of her limbs and body as soon as she began to advance from the far end of the room, set me in a flutter of expectation to see her face clearly. She left the window— and I said to myself, The lady is dark. She moved forward a few steps— and I said to myself, The lady is young. She approached nearer— and I said to myself (with a sense of surprise which words fail me to express), The lady is ugly! Never was the old conventional maxim, that Nature cannot err, more flatly contradicted— never was the fair promise of a lovely figure more strangely and startlingly belied by the face and head that crowned it. The lady’s complexion was almost swarthy, and the dark down on her upper lip was almost a moustache. She had a large, firm, masculine mouth and jaw; prominent, piercing, resolute brown eyes; and thick, coal-black hair, growing unusually low down on her forehead. Her expression— bright, frank, and intelligent— appeared, while she was silent, to be altogether wanting in those feminine attractions of gentleness and pliability, without which the beauty of the handsomest woman alive is beauty incomplete. Well, as I said, Walter was a bit of a git. However, this is one of the examples in the book that shows how Collins set out his narratives and that he did to include humor, even if it was kinda shallow. Some of us rush through life, and some of us saunter through life. Mrs. Vesey SAT through life. So, why did The Woman in White not sweep me off my feet? I guess the simple answer to this is that the story dragged. A LOT. I’m at a loss to see why we needed to read the Third Epoch, other than this having being printed as a serial originally and Collins obviously kept the story going for a paycheck. I loved her. Ah! how well I know all the sadness and all the mockery that is contained in those three words. I can sigh over my mournful confession with the tenderest woman who reads it and pities me. I can laugh at it as bitterly as the hardest man who tosses it from him in contempt. I loved her! Feel for me, or despise me, I confess it with the same immovable resolution to own the truth. 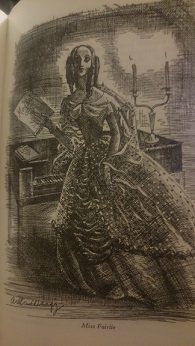 The Victorians tend toward verbosity – Collins no less than Dickens or Trollope. But, I enjoy Collins always, which isn’t true of Dickens. Let me know if you want to buddy read another Collins. I did notice that DWS is tackling Hardy, but as I have seriously disliked two out of the three Hardys I have read, I was going to abstain. Unless, Jude ….. but no promises there because one has to be in the right mood for depression. I was interested in the Steinbeck read. Possibly. I need to check whether I have the anthologies of letters. However, I will probably join the read for Imperial Woman. I have it on my shelf, but need to finish the Mann book that I keep getting distracted from. Ah, never mind. I thought there were two authors….. Yeah, the vote confused me. It’s cool. Thomas Hardy it is then. That’s OK – I am still interested in reading Steinbeck, so let me know if there is something specific you want to read. Will do. I am a big fan of his. Are there specific books you are keen on? I would like to read The Log from Sea of Cortez at some point but am really open to other suggestions. I also have A Life in Letters and can get other titles from the library. Btw, I’m still up reading The Moonstone, too. So, so many! I want to read: The Winter of Our Discontent, Log from the Sea of Cortez, In Dubious Battle, Once There Was a War, A Russian Journal, and I want to reread East of Eden.